DML is a free movie library / movie database that allows users to catalog their personal DVD, Blu-ray or 4K UHD movie disc collections quickly and efficiently. Whether you want to run a movie library on your home theatre PC, or run it on your laptop while away from home, DML is the perfect solution. It allows you to store your DVD/Blu-ray/4K UHD movie disc information (downloaded from themoviedb.org ) and then select the movie title for playing (as long as you have a movie backup file available of course) with your favourite media playing software. Ever wanted to run a movie cataloging app from your work laptop but couldn't because your IT dept won't allow you to install apps? Just download the free DML zipped folder and unzip it to wherever you want to run it from. DML does not need to be installed on the machine it is running on. It will run quite happily from a thumb drive, or even the removable drive you may be storing your movie files on. DML is a Windows based DVD movie library. It is designed primarily to run using Windows 10, but will run on Windows 7 and 8 machines also. DML is provided here as a free download. The movie data and images are acquired through (TMDb) API. Individual movie titles can be added through the DML - TMDb download interface. Multiple movie titles can be downloaded using your existing movie files / folders, or simply make a list to download (DML can even help making the list). At the time of adding individual movie titles, the user can choose from many background and cover images, as well as edit any of the information received. The data is then stored locally and is available for the user to be able to edit the movie title information or change background and/or cover images through the provided editing interface without re-acquiring all information again. 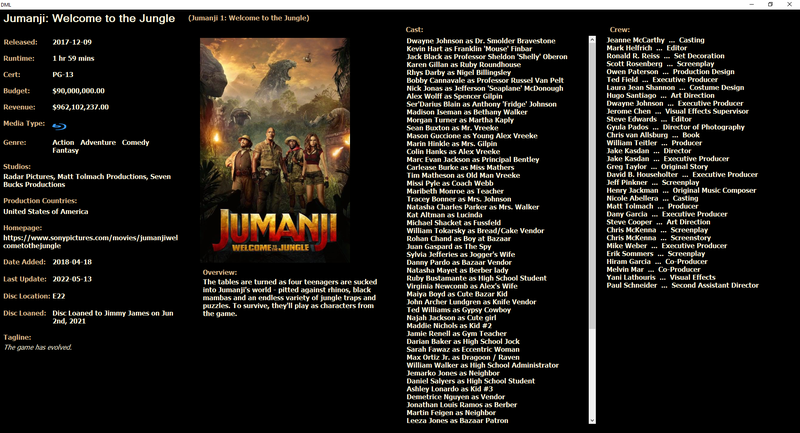 The image above shows the DML main screen with the movie title "Jumanji Welcome To The Jungle" selected. Note the Disc Type logos (DVD and Blu-ray in this snapshot) on the bottom left of the movie cover tiles. These logos are a quick check to tell you whether there is a backup file available to play this movie. The logo will only appear on the movie selector tiles if there is a file associated with the movie title. If you have disconnected your movie hard drive or network drive, these logos will not be visible. In the case where there is no file available to play, the disc type of the selected movie is displayed in the header beside the 'My Rating' value as shown below where the logo for a Home Movie disc is shown. The logos also allow you to keep track of what type of disks you have for the movie titles in your library. If you are upgrading your DVD copies to Blu-ray, or Blu-ray to 4K UHD, you can create separated lists of DVD, Blu-ray, and 4K UHD discs. This helps you to keep track of what has been upgraded so that you don't buy upgrade disks that you already have Blu-ray or 4K copies of. If you have an Android phone, you can use the DMLMobile or DMLMobile_Free app to carry your library with you instead of creating separated lists. With the search function in the apps, finding movie titles is a breeze. The number of actors displayed here depends on the amount of screen space above the movie titles and whether you have chosen to display two rows of movie titles or one. To view more information on any movie, select it and then right click and choose "View All Details For This Movie" from the context menu options as shown below. To return to the main display, just click anywhere on the screen. This display will show all actors and crew members. If there are too many for the display, the list will scroll as shown above for the actors list (cast). Additional fields not shown on the main display other than crew, are the date the title was added to the library, the date the title was last updated, the location of your disc (if you have specified this), and Whether the disc is loaned or not. If the disc is currently on loan, the display will show who it is loaned to and the date it was loaned. If more information on any movie is required, simply right click over the selected movie and select "View This Movie Title On TMDb" and you will be taken to this movie on the TMDb website where you can view all details of the movie. If you would prefer to view your movie titles without the text drawn across the background image of the selected movie, it can be turned off as in the below example. Either one or two rows of movie titles can be displayed - as seen in the image below (two rows with text overlaid). If you would like to view the background image unobstructed, simply right click on the center of the screen and select - "Hide All - View Background Image Only" from the context menu as shown in the image below. This will display the background image only. No controls are visible as seen below. The five buttons at the top right of the main screen - used to display movie or music mode, and the lower, resize, and close buttons. 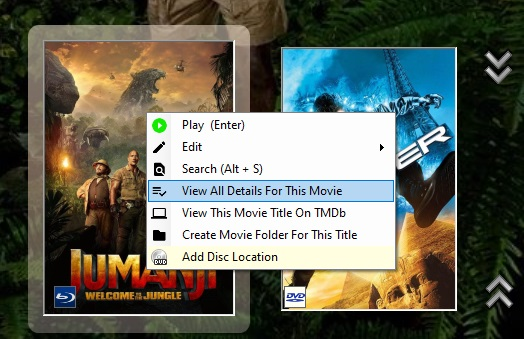 The three context menus accessed by right-clicking on the top infomation bar, the main screen, and the selected movie tile. The keyboard and mouse are used for navigating through the library. The mouse (if using a scroll mouse) is used to scroll up or down through rows of movie titles. Position the mouse over a title in a row to select that particular title for viewing or playing. Right click to get the menu shown below to play the movie, or simply press the enter key to play it. As long as you have a movie back up file available, DML will tell your favourite media player which file to play. The up and down arrow keys on the keyboard are used to navigate to the next or previous rows of movie titles and the arrow left or right keys navigate along the rows of movie titles. Pressing any of the alpha keys will take you to the start of movie titles starting with that letter. If no movie titles start with that letter, DML will not do anything. All controls are explained further in the Instructions section on this site. As shown above, the disc location (if you have specified a location) is displayed in the Selected Movie Menu. Just right click the selected movie to see this so you can quickly access your disc. Sorts the library alphabetically from A to Z but when a title starts with "The", it ignores it and sorts starting with the next word. I.e. "The Hunger Games" would be sorted as "Hunger Games". Sorts the library alphabetically from A to Z. Sorts the library alphabetically from Z to A. Sorts the library by the movie release date - newest to oldest. Sorts the library by the movie release date - oldest to newest. Sorts the library by the date it was added to the library - newest to oldest. This option re-loads all movies from file and displays them using the default sorting option - from A to Z Ascending. Limits the displayed titles to only those that have a movie file available to play. Limits the displayed titles to only those that feature the specified actor. Limits the displayed titles to those that have a certification rating of either, "PG", "PG" & "PG13", or "R". Limits the displayed titles to those that match the selected genre. This allows users to rate their movies as they see fit. Once rated, the movie titles can be filtered to have DML only display movie titles with the specified user rating and above.